In good condition (please note: the hilt is original WW1 browned, not completely rusted), a scarce WW1 browned British Non Commissioned Officer's sword. 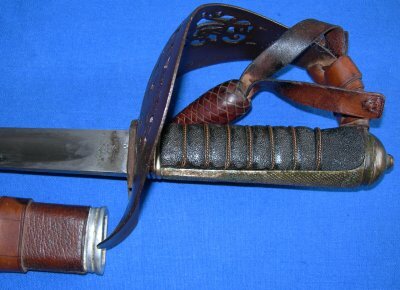 A chemically browned hilt NCO version of a British WW1 infantry officer's sword; a very scarce item as there were very few of these swords to start with and most ended up being "cleaned up" after WW1. Both the inside and outside of the hilt are browned. The 32 1/4 inch plain blade is in very good condition, marked to maker "EFD" (Enfield Small Arms Factory), has an acceptance stamp and "'01" to the obverse, likely meaning the blade was originally made in 1901 (normally there are month and year markings, so we can not be sure). The WW1 chemically browned hilt is in good condition, some small spots of lost browning, nothing too much. The fishskin grip and twisted grip wire bindings are in good condition. The leather sword know has a glued repair. 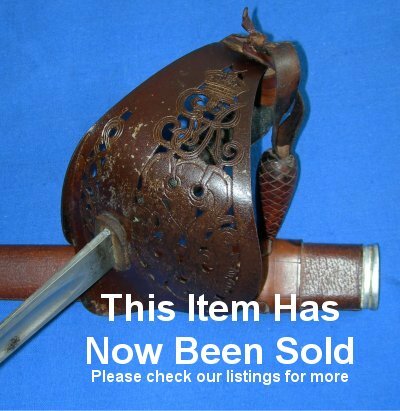 The leather field service scabbard is in good condition; the sword sheathes and draws well. A nice example of this scarce version; you will not come across them often, so ours is a very good price and investment. Please quote item reference I64 (1074). Further / full sized images upon request.